Having attended countless weddings as a singer, bride Jules’ discerning eye made organising her big day in London that little bit easier. But as she points out, planning a wedding isn’t a solo effort - compromise is key. Jules and husband Oly also called on friends and family to collaborate on what they describe as a ‘feast of creativity’, with loved ones responsible for baking the cake, arranging flowers and composing readings. With music central to the big day, Jules called on her gospel choir to serenade the congregation and advises all couples not to overlook the magic of live entertainment. The bride dazzled in Charlie Brear’s Sine Catroux dress, a cowl-backed gown with a drop-waist reminiscent of an elegant, ‘20s-style silhouette. Jules and Oly’s festivities were captured by dynamic duo Emilie and Jessie from Paper and Primrose. We wanted our wedding to be colourful, uplifting, relaxed and meaningful. I sing professionally at a lot of weddings throughout the year so I had a lot of ideas of what to do and what not to do! We wanted to make it a really fun day for everyone, especially those who travelled a distance to spend the day with us. We're both Christians so the spiritual side of the wedding meant a lot to us, yet we wanted to make it relaxed and understandable for everyone, whatever their faith. When and where did your partner propose to you? Oly proposed to me on Valentine's Day on a beach in Thailand. He had booked us a table for dinner at sunset. I thought at the start of the evening that he might propose, but after three hours I had inwardly talked myself out of the idea. It was during one of my small rants about politics he silenced me by getting down in the sand on one knee! Which dress did you choose and why? And where did you buy it from? I wore a Sine Catroux dress from The Bespoke Wardrobe in Ingatestone. I wanted something beautiful and vintage but not a meringue so when I found Charlie Brear, I fell in love! It was difficult finding the right one for me, but I was so taken with the back of the dress and the lace. I loved the flattering ‘20s style dropped waist which meant I didn't need to worry about losing weight to get in it. I found that I was best looking for dresses on my own, as I know my own mind quite well. There was some pressure from family to choose a big dress, but Charlie Brear's style is so elegant, and beautifully understated, there wasn't really another option for me. Out of about 10 shops I visited, my best experiences were in the Charlie Brear flagship store and The Bespoke Wardrobe. It was a relief not to have to try on another big dress! I felt understood and not forced into something that wasn't quite right. What would your advice be to other brides shopping for a wedding dress? Go with people who are encouraging, supportive but also truthful! How did you feel after you had ordered your dress? I wore heels during the ceremony from Moda In Pele, and sparkly flip flops from Debenhams in the afternoon and evening. Did you struggle finding the right lingerie that worked with your dress, if so would you recommend anything for future brides? Because of the open back of the dress which was covered with lace, I thought it would be really difficult to find lingerie that worked. But it turned out I had a bra already which was perfect. It had clear straps which were kindly hidden by the lace. I was lucky in that respect. Who did your hair & make-up and how did you find them? I did my own hair; with its unpredictable curls, I didn't want to take a chance on getting someone else to do it. My good friend Bianca Temowo is a make-up artist and she was a wonderfully calming presence on the day too. Having your make-up artist as a guest was pretty helpful for the odd touch up too! Where and when did you get married? We got married on October 1st 2016 at our regular church: Christ Church Fulham in Parsons Green, London. How did you feel walking down the aisle? I had imagined my entrance for years before I'd even met Oly - I had heard a song by Amel Larrieux called 'Beyond' and it encapsulated love and the wonder of marriage to me both musically and lyrically from the first time I heard it. I kept the song a secret from pretty much everyone but wrote the lyrics in the order of service. We waited for two minutes before walking in to build the anticipation. When I finally walked down the aisle I was so happy to see everyone - and most of all, Oly's beaming face from the other end of the church. I'll never forget that picture. He is a man of few words but that moment said so much to me. 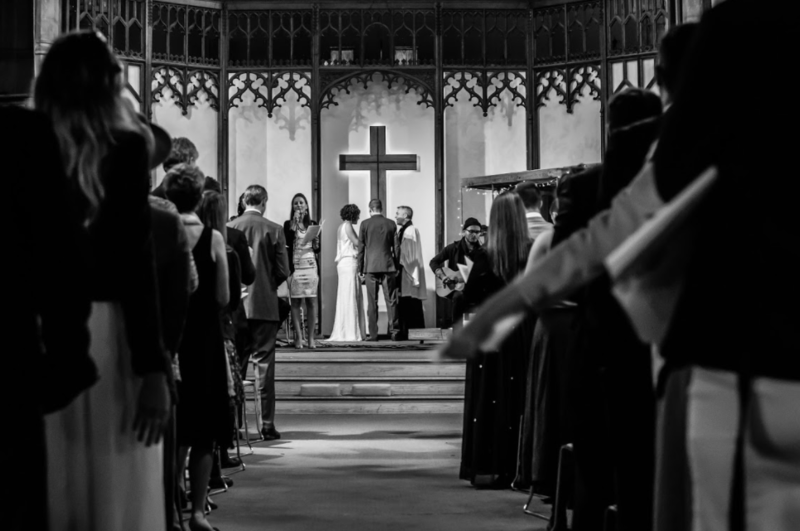 We're not massively traditional people, so although our wedding followed a few traditions - being in a church, for example, with readings and songs - we tried to keep everything fresh and new for people. The one tradition we kept which I cared nothing for was cutting the cake. I don't understand why that's so important! Did your wedding have any quirky or unusual features? Our vision for the day was that it would be a feast of creativity, and as we have lots of creative friends, we got them all involved. We had the gospel choir that I sing with lead all the songs on the day - my favourite part was watching them sing 'Love Has Fallen On Me' by Chaka Khan during the signing of the register - something I first heard on the credits of the film, ‘27 Dresses’. Our friend wrote a story called, 'The Songbird That Couldn't Sing' which he performed during the ceremony - fitting, as Oly doesn't sing at all - plus artwork by another friend on the order of service. And my chief bridesmaid wrote a poem instead of a speech for the evening. What was the funniest moment of the day? Probably when the best man got Oly and I to lovingly stare at each other during his speech - and then proceeded to tell us that we were looking at the most likely person to be murdered by! That sounds horrible written down but it was hilarious at the time! If you could do it all again, would you do anything differently? There are little things that didn't go to plan, but nothing to regret. I think the only thing I would do differently would be to try on my dress more times that I did before the big day. Did you find organising your wedding an easy process? What parts were easy and what parts were trickier? 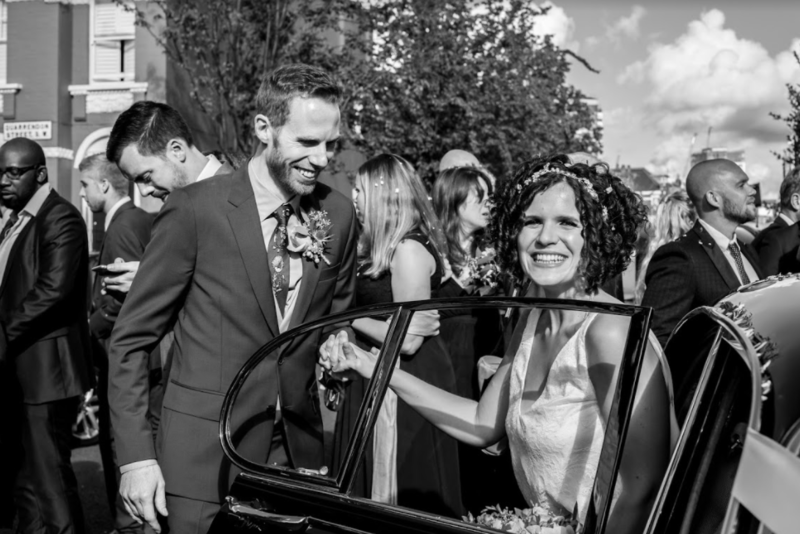 Because I have attended so many weddings, and being married at 35 means I am one of the last of my friends to get hitched, I knew a fair bit about what to do. However, organising a wedding with someone else was far trickier than I thought. If I could have done it on my own it would have been so easy. However, it was great preparation for marriage - we learned so much about each other in those months! I was really thankful for Oly's sister who did the flowers - without her we wouldn't have had a colour scheme. Music, food, dress, venue were easy... deciding on a colour scheme was not. What will you do with your dress now? I'm still undecided as I’m quite attached to it, but I may give it to charity at some point so that someone else can get as much joy out of it as me. What are you and your husband's best memories of the day? There are so many... my favourite is probably his speech in the evening - it's not often he says so explicitly how he feels so I'm so glad I got it filmed and can watch it again! His favourite memory is me walking down the aisle. Get your friends and family involved with whatever talents they can bring. We had friends make the cakes, provide the music, design the order of service, pour the champagne, write stories and poems, do the flowers. Not only does it save money but it also feels so special for them to be involved. The most important part of the day is the ceremony so put your effort in to making that special - imagine and visualise it before it happens, practice the walk down the aisle, search for good readings and songs you love and most of all do your best to feel relaxed and savour each moment. Make friends with (or at least talk to!) your vicar or registrar so that you have a good rapport on the day. They will have loads of advice for you from all the weddings they've done too. Be on time as much as possible. Make the most of the day as it goes in a flash and keep your guests (and fiancé!) on side. They will be a bit grouchy if waiting for 30 minutes, an hour, two hours...! Music is really important and memorable during the day so take your time to find the right band/ensemble/singer for you. You get what you pay for when it comes to music, so consider that when fixing your budget. Shoes & Accessories - Shoes were Moda In Pele. I got my shawl and head dress from a fairly cheap online store called JJ's House. Bridesmaids' dresses- All different! A selection from ASOS and high street stores. Did you catch last week's friday bride, Erin?